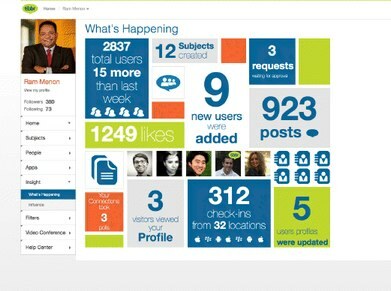 Tibco has a new enterprise social graph that includes a partnership with Box and a Klout-style service for the enterprise. What a contrast to Salesforce.com and its new Chatterbox. Instead of building its own file storage technology, Tibco has moved to partner with Box and offer integrations through an API. The move gives Tibco a deeper third-party play, and Box gets an installed base of 1 million Tibbr customers. The new partnership and updates come as part of Tibbr 4, the latest release of Tibco’s social enterprise offering that the company unveiled today at Tucon, the annual conference here in Las Vegas. In addition to Box, Tibco is announcing partnerships with Badgeville, Wayin, Teamly, and other third parties that will offer their services as part of a Tibbr marketplace. Launched about two years ago, Tibbr has one of the strongest activity stream products on the market but until now has lacked third-party integrations. Today’s updates, which also include a new enterprise grade API, charts a new course for the company’s play in the social enterprise space. Next year the company will begin building a developer ecosystem to make Tibbr a platforn for app development. Tibco is leveraging its experience as an integration company. Chairman and CEO Vivek Ranadivé said to me that the company’s BUS software is the company’s crown jewel. It gives a way for apps to talk to each other. For Tibco customers, it allows for a single-pane view of Tibbr and third-party apps that can be viewed in their own environments. Ram Menon is president of social computing at Tibco. He said with Box, Tibbr has an integrated view that shows the running conversations with the document. The document is in Box and the conversations are in Tibbr. 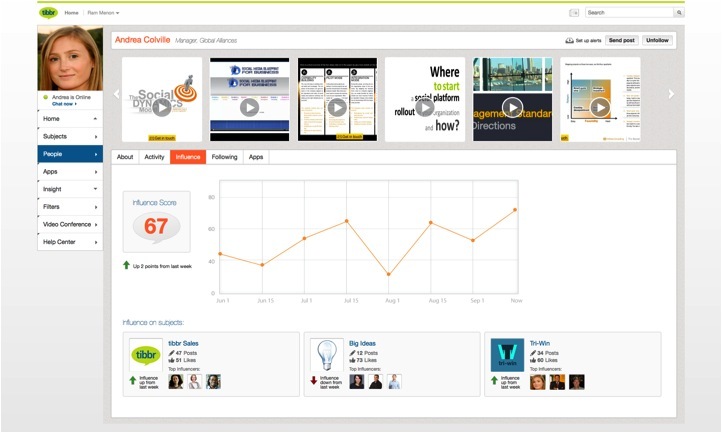 The new Klout-style service points to the deep rivalry that Tibco sees with Salesforce Chatter. Company executives say the whole Facebook for the enterprise talk is a charade. On stage, Ranadivé called it “fools gold.” He says you think you are getting gold with a Facebook-like service, but in reality it is not meant for the workplace. With the Klout-style service, influence is measured in the context of work. Klout measures updates from social networks. Tibbr looks at the user’s activity in the context of work to build a score. The person’s profile can then be seen in a view that resembles an infographic with a Pinterest look and feel. Menon says about 60 percent of Tibco customers use the on-premise version of the Tibbr service. That’s pretty high and points to Tibco’s weakness. Tibco, by all measures, does not have much credibility as a company embracing cloud computing. They tell me they have lots of customers who can’t for one reason or another use the cloud due to compliance reasons and so on. Their response resonates as an excuse, not as a credible viewpoint. Instead, Ranadivé uses marketing terms like Software-as-a-Self Service, which to me just points to how the company is trying to show that it is better than Salesforce. Ranadivé says SaaS is over. I am not so sure about that. He might want to look at Salesforce’s trading price today. It’s hovering around $148 per share. Still, I can’t help but see a level of innovation that stands on its own. Salesforce does talk a lot about social, hammering the point over and over. Tibco’s approach is more sophisticated and you see it in Tibbr. It has geolocation capabiltties so you can tag a physical object with important information. It is event-based, meaning it can use its messaging architecture to provide updates to apps and other services within a timeline. Overall, Tibco needs to tell a better cloud story, especially if it hopes to attract developers who rely on services such as Amazon Web Services for serving their web apps to an increasingly savvy business user.